Bring the living room to life with this unique combination of entertainment center and fireplace! With an LED remote-controlled fireplace, hidden casters, and a wide array of DVD trays and sturdy shelves, the Amish Elizabethtown Classic 54" Fireplace TV Stand promises to be at the very heart of your family's home life for generations to come. There's nothing like a family movie night complete with loved ones, fluffy blankets, fresh popcorn, and a warm fire. 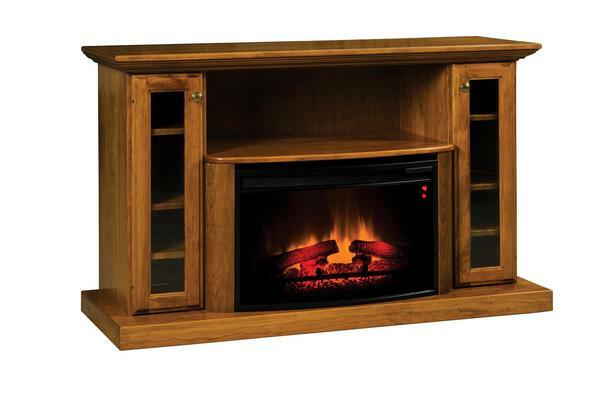 Create an inviting focal point in your living room, bedroom or den with this Amish fireplace entertainment center. Your Amish built electric fireplace offers all the benefits of a decorative heater and relieves you of the inconvenience of fireplace maintenance. Take a look at our collection of Amish Fireplaces that offers corner units as well. Each of these remarkable pieces is built by hand in Indiana by a family-owned wood shop, assuring only the best in home-grown quality and attention to detail. The LED fireplace also comes with a two-year warranty for complete piece of mind.